You might think of central Alaska as a frigid and snowy place, and it can be. But for about 90 days in the middle of the year, the sun gets up around 4 a.m. and stays up until about midnight, making for a compact, but intense growing season. The Fairbanks Community Garden takes advantage of this, as well as the enthusiasm of Arctic gardeners who want to get outside and put some food by for the winter while they have the chance. With the help of some plastic mulch and other ground covers to warm up cold soils, Alaskan gardeners in this city demonstrate the influence determination can have on our ability to produce our own food. The Winston-Salem area has the distinction of hosting what’s credited as the oldest community garden in the United States. Started in 1759 by immigrants from what is now the Czech Republic, the garden was designed to furnish the new settlement of Bethebara—a temporary predecessor the future permanent town of Salem—with medicinal herbs and vegetables. Today, Forsyth Community Gardening stewards 160 community gardens in the Winston-Salem area. The group also offers classes, networking opportunities, seeds, and access to basic garden equipment. With more than 50 total acres of community gardens and some of the oldest and largest gardens around, Boston boasts a well-established community gardening tradition. The seven-acre Fenway Victory Gardens were established during World War II to help city dwellers feed themselves and their neighbors and still exist today as the last of the original large-scale victory gardens built throughout the U.S. The city was also home to B.U.G., short for Boston Urban Gardeners. Beginning in 1976, B.U.G. was a trailblazing project in the modern urban agriculture movement, making explicit connections between urban food access, land use, affordable housing, and other issues that many 21st century urban gardeners may presume to be part of the conversation. According to a 2006 count, the Fenway Victory Gardens alone hosted approximately 535 gardeners, and city officials estimate that all of Boston’s gardens collectively offer food production space to 10,000 Bostonians. The scale of cities is often one of their greatest challenges. In Detroit, where acres of lots have gone to seed, been leveled, or been vacated in recent years, the city’s residents are showing how scale can be leveraged to create positive results. According to Environmental Protection Agency officials, between 2000 and 2014, the number of gardens in Detroit grew from double digits to nearly 1,500. According to Forbes Magazine, community gardens in Detroit produce upwards of 400,000 pounds of fresh produce per year. The momentum sparked by community gardeners in Detroit has attracted urban ag entrepreneurs and others interested in city-growing at a scale, turning the city into a laboratory for testing innovating and large-scale urban farming projects, as the city’s smaller community gardens continue to thrive. This central Texas oasis contains more than 40 community gardens that yield more than 200,000 pounds of food each year. More importantly, the city government is actively involved in the process, supporting prospective gardeners and their land search by offering a formalized application process to establish gardens on city-owned land. The application includes a crash course in organizing a successful garden and gardening team, and also requires gardening groups to partner with a local non-profit for extra support and potential fiscal sponsorship. The city also offers waivers for fees related to site plans and water taps. Portland is another city that proudly integrates community gardening into its regular civic functions. Residents can go on to the city’s Parks and Recreation website to easily request a garden plot, check plot availability, check event calendars, and more. Even with 50 community gardens across the city, demand for garden plots in Portland is so high that the city maintains waiting lists that can stretch to nearly 90 people for some gardens, and many gardens have twice as many people waiting as there are gardening. Fortunately, Portland has also inspired many innovative private community gardening projects such as The Urban Farm Collective that give locals access to growing space by decentralizing production across lots and lawns throughout the city, while also conserving those sites as agricultural land through a partnership with the Oregon Sustainable Agriculture Land Trust. The lushness of Hawaii’s climate is not lost on local growers in Honolulu, where residents have been keeping community gardens since 1975. Annual fees at many of the gardens are as low as $20, and several of the gardens host more than 100 plots, with the 8.5-acre Wahiawa garden across from Wheeler Army Airfield hosting 465 garden spaces. The large, 20-ft. X 40-ft. plots at this particular garden allow experienced community gardeners to scale up and stretch their gardening muscle, all within minutes of Oahu’s famous beaches. 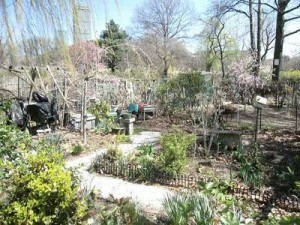 As with many other things in New York City, the city’s official community gardening program is touted as the largest in the country. The Green Thumb NYC program began in the 70’s when the city’s cash shortages, loss of manufacturing, and other economic problems lead to the turnover of a large number of vacant lots, which were then repurposed by volunteer groups around the city. From that beginning, Green Thumb has turned into a network of more than 600 community gardens in all five boroughs, which also provides monthly gatherings where supplies, education, and other gardening information are exchanged. Gateway Greening has been working on urban environmental issues in St. Louis since the early 80s and today supports more than 200 gardens throughout the city. The gardens range from typical allotment style vegetable gardens to urban orchards, native plant gardens, perennial gardens, and community gardens at public libraries. The organization also manages a 2.5-acre urban farm, youth gardening programs, and annual downtown beautification projects. There aren’t a million gardens in Louisville, but the number of ways the city and local non-profits spin the template of a community garden is worth recognizing. Through a combination of non-profits such as Louisville Grows, the local extension office, and hard work by neighbors, Louisville has a highly diversified community garden scene that includes a community food forest, community orchard, community gardens that produce CSAs, a community garden doubling as a counseling center for refugees working to adjust and recover from trauma, and an urban growers cooperative that helps urban growers collaborate for labor, tools, distribution, and other necessities. Want to find a community garden near you? Try the American Community Gardening Association’s search tool and map.